Gotta Dance Dancers perform in full-costume at our large end-of-season concerts. Concerts are directed by our esteemed Concert Director, Gabriel Chajnik a graduate of the prestigous Julliard School. 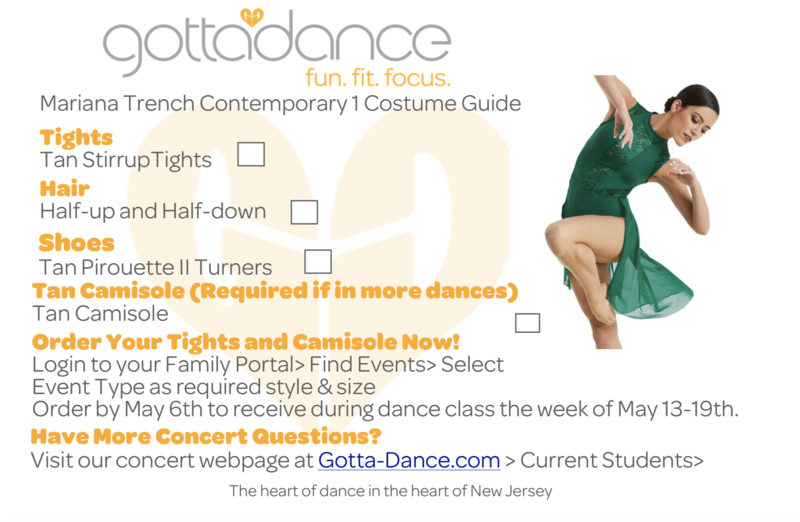 Gotta Dance produces highly artistic and professional concerts that wow audiences year-after-year. 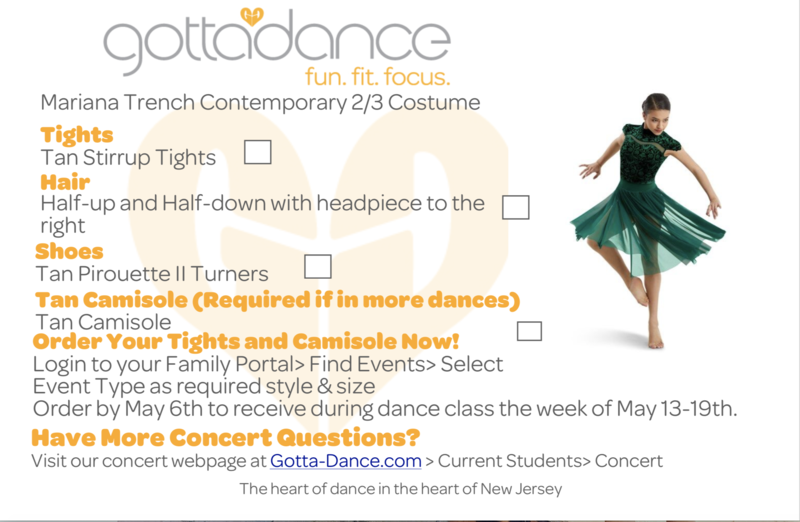 For 30 years, Gotta Dance teenage InTurns, Dance Educators and Staff come together to vote on the concert theme. 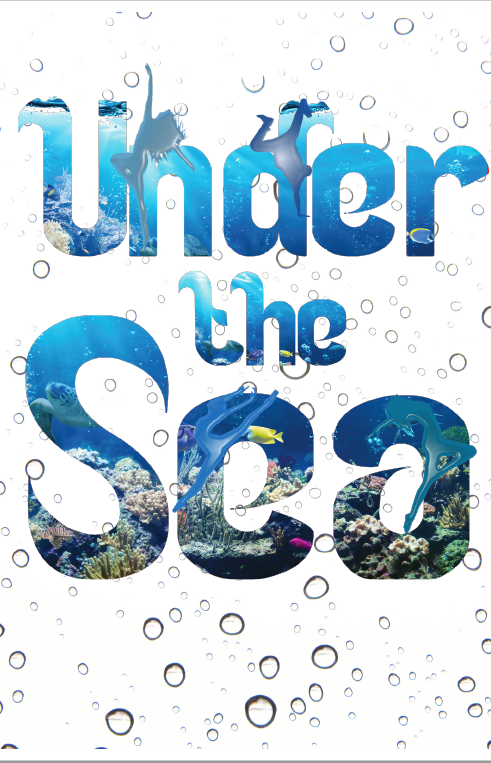 Under the Sea was chosen unanimously! 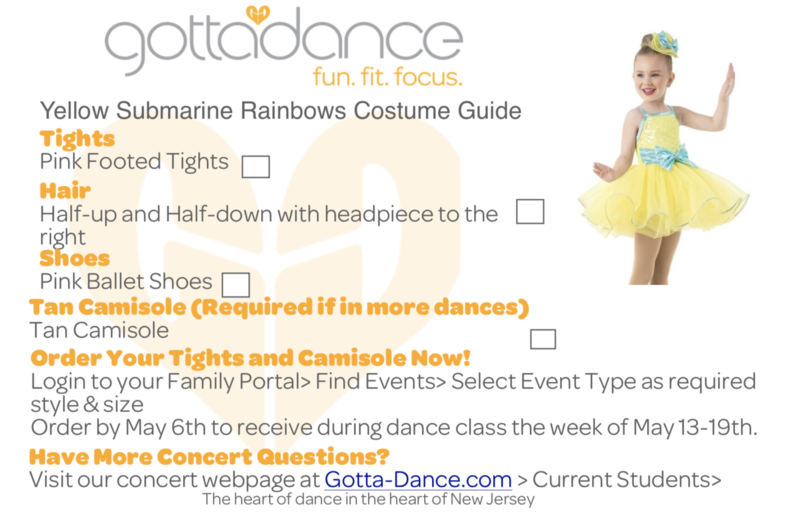 Every class dance, from Rainbows-Workshop, Adult Tap, Adult Street Hip-Hop & Dancing Dads, will be inspired by this theme. 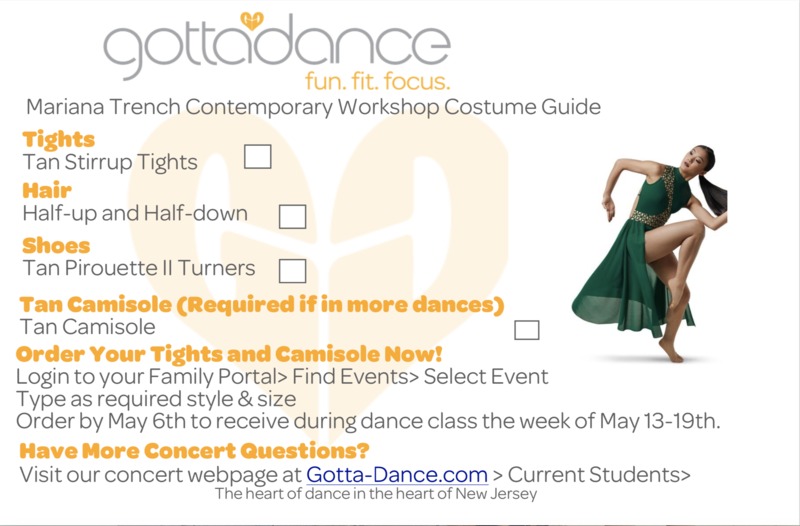 All Gotta Dance Concert Performances and Dress Rehearsals are located at The Raritan Valley Community College in the NASH Theater. 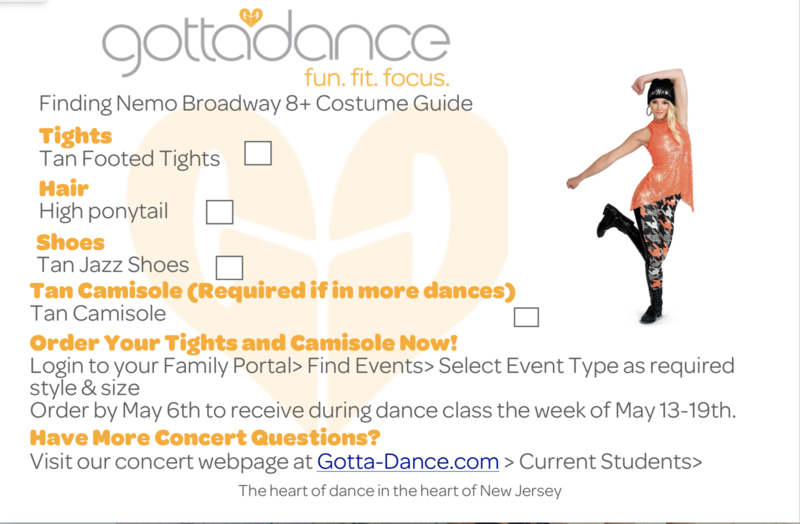 To view your Dress Rehearsal and Concert > View our Schedules page and click on your class! 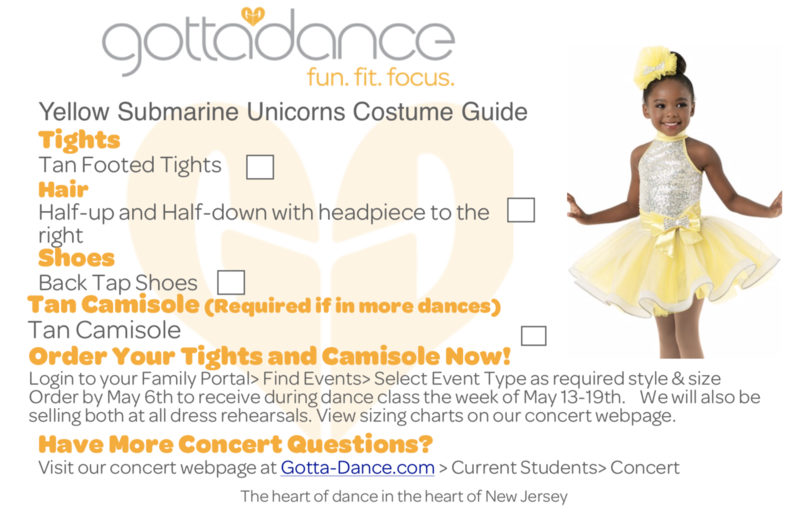 When you login to your portal you will find a link with your Under the Sea concert music. Have fun practicing, you’ll be on the stage before you know it! A $135 concert fee is a one-time fee billed in January per class. 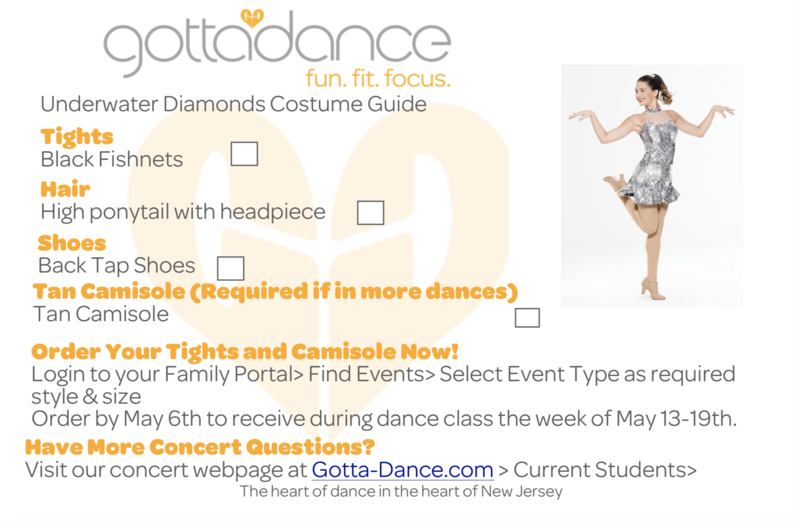 The fee covers your dancer’s costume, four concert tickets and the fees associated with a full-scale professional production which includes, lighting, set rentals and design, a stage and sound crew and a professional theatre. 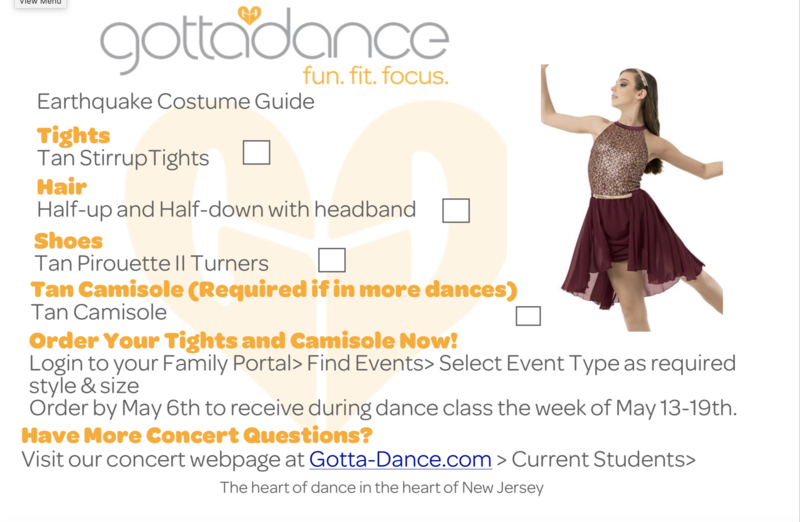 Please arrive 30 minutes prior to your dancer’s dress rehearsal in full costume and ready to run through their dance on the stage with their class. 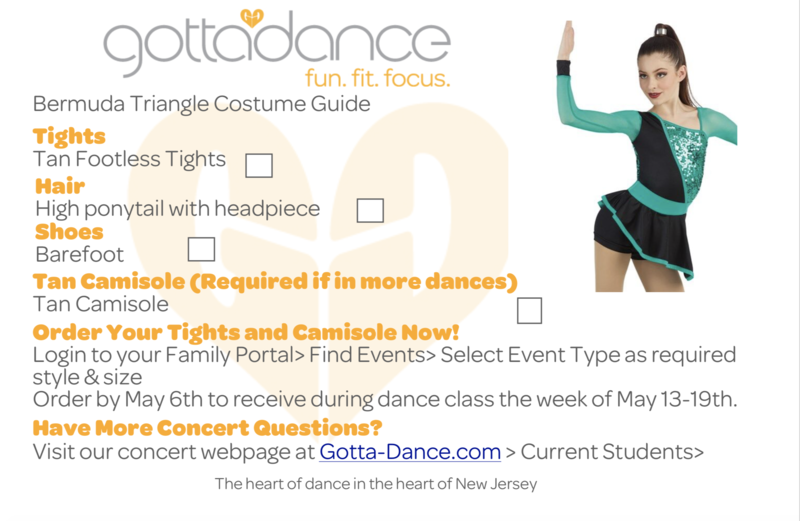 You are welcome to watch your dancer’s dress rehearsal and take as many pictures and videos as you’d like.We ask that you don’t take any photos/videos during concerts. 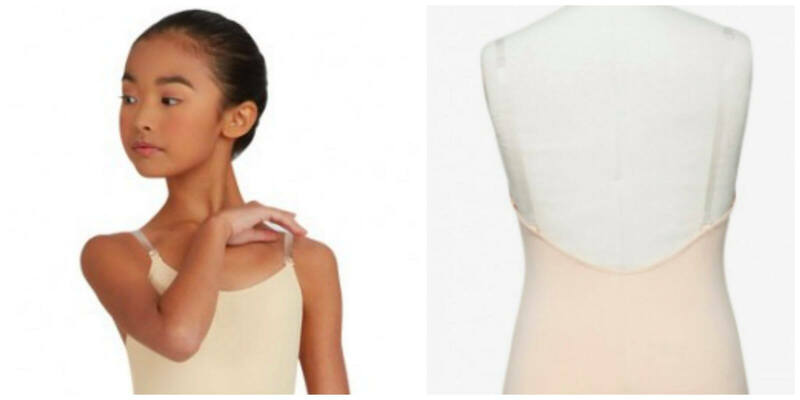 Flashes are distracting to our dancers and can compromise performance quality. We appreciate your understanding. 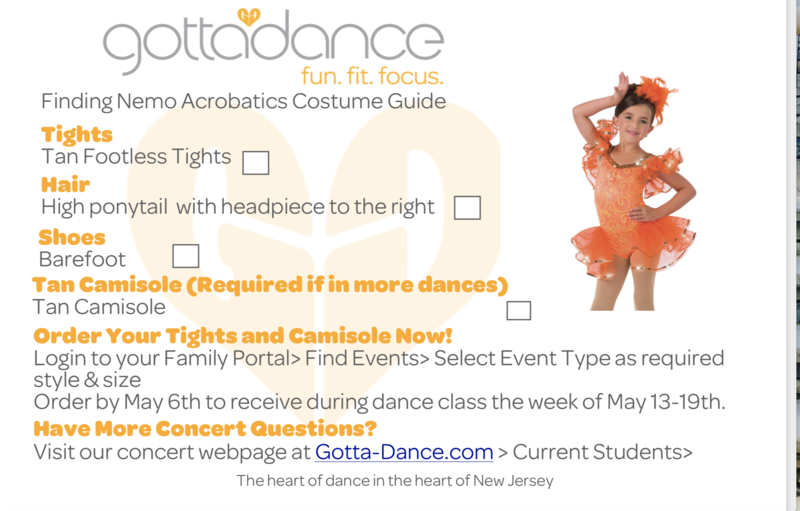 Complimentary tickets; Dancers automatically receive four concert tickets for each concert fee paid. 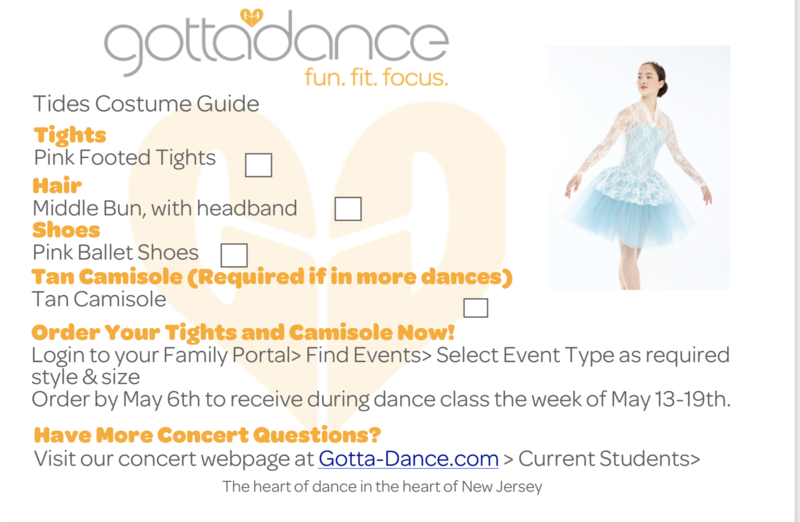 Tickets are available for pickup at your dancer’s dress rehearsal. 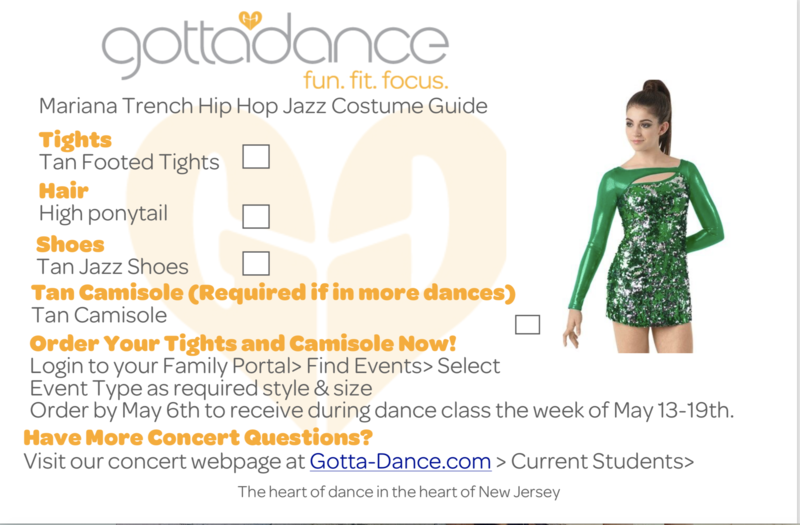 Please note: Your dancer’s tuition must be paid in full in order to receive tickets. Please remember to be respectful to our ticketing staff in the case that extra tickets run out during dress rehearsals. All families are guaranteed their four tickets as promised when they paid the concert fee. 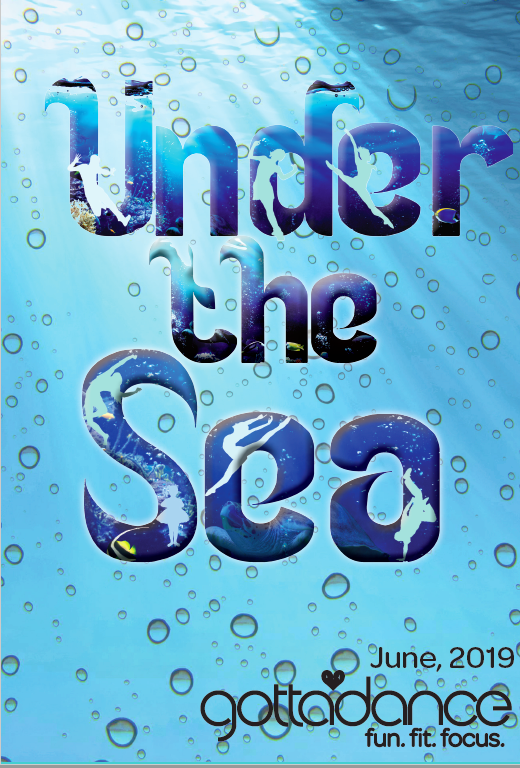 Extra tickets will be available to purchase for $20 per ticket at Raritan Valley Community College’s Nash Theatre beginning SATURDAY, JUNE 1ST AT 8:00AM. Remaining tickets will then be sold at all dress rehearsals as well as one hour before concert time. 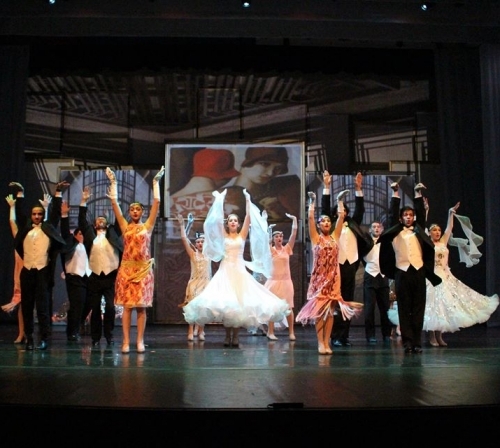 According to Raritan Valley Community College’s guidelines and regulations, every person must purchase a ticket upon entering the theater. This includes children of all ages (including infants), even if they are seated on an adult’s lap for the entire performance. Cash or check only. We always sell tickets on a first come first-served basis. All tickets are final sale. There will be no refund issues for purchased tickets. An hour before each concert time, remaining tickets will be sold and current tickets can be traded up as per availability. As a result, more tickets are likely to be available at this time. 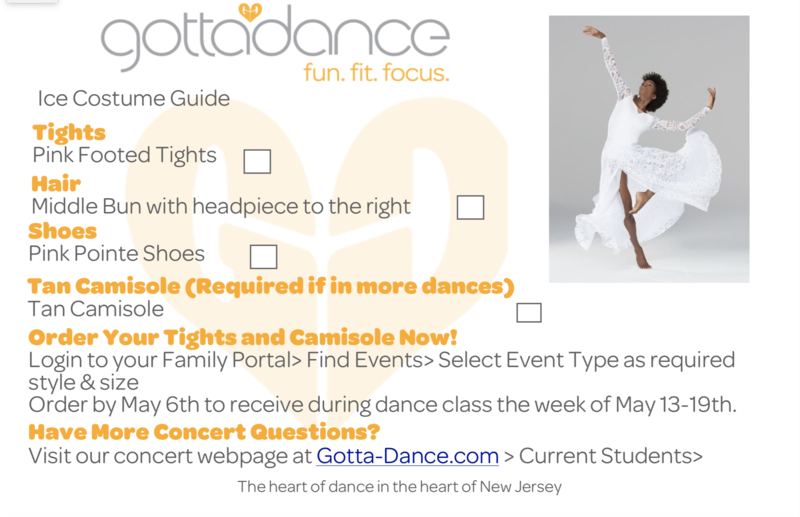 Gotta Dance has been able to seat everyone for 30 years! 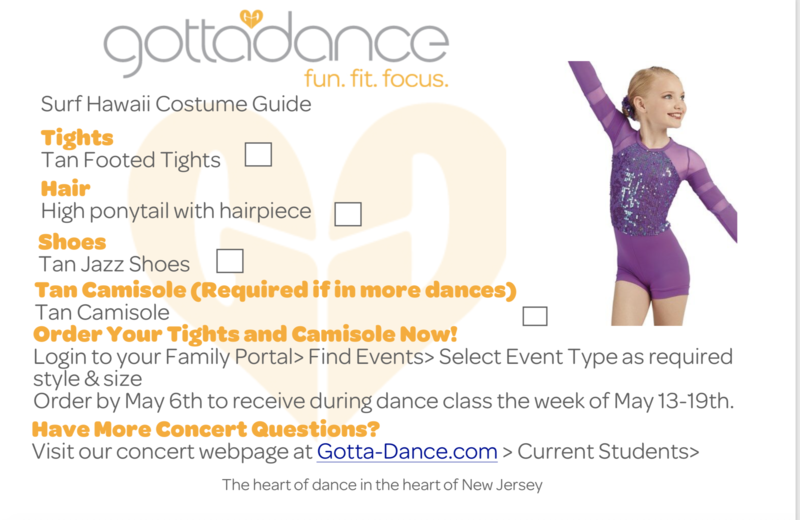 Dancers receive their costumes in dance class, Sunday April 28th- May 4th. 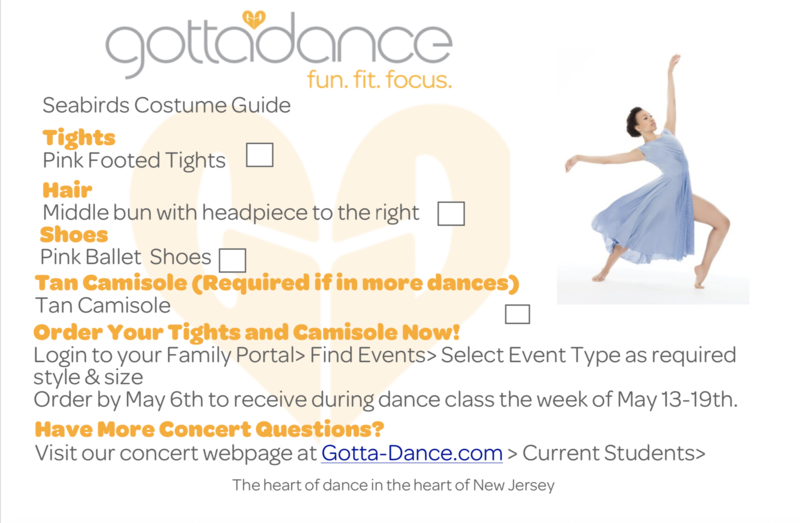 Dancers may only exchange their costume once, and it may only be done the day that you receive the costume in class. 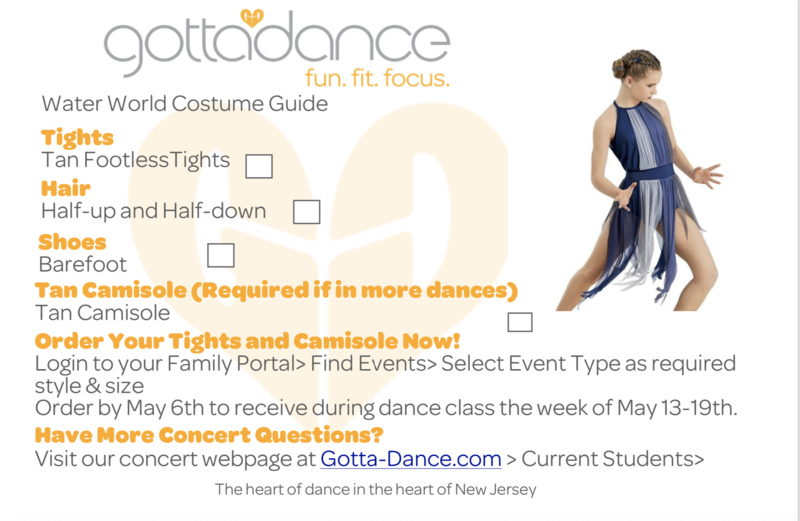 Please be absolutely sure that you would like to exchange the costume for a different size, because once it is exchanged, it is yours to keep! Once the costume leaves the studio, it cannot be exchanged for any reason. 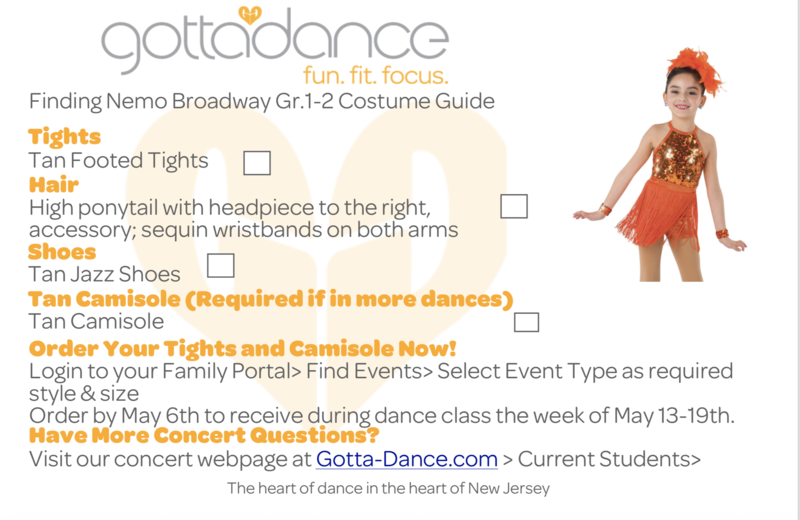 Please double check that all of the costume’s accessories are included when you first receive your costume. 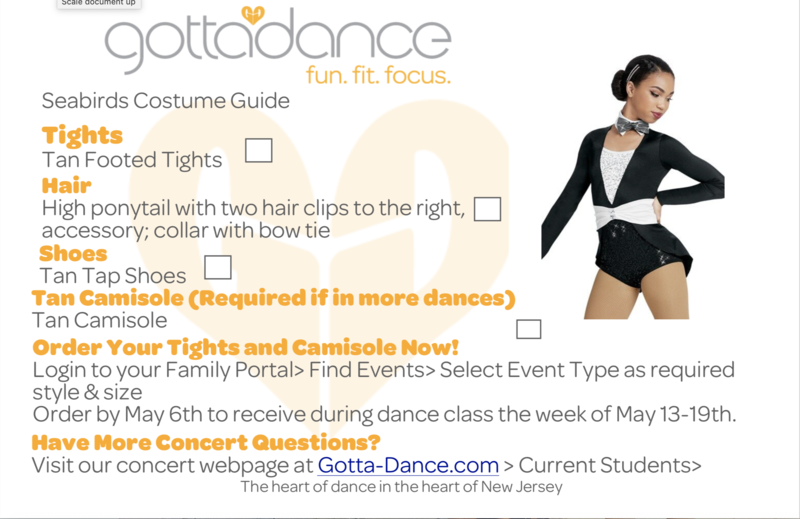 Everything your dancer needs for their concert is listed on the Concert Guide! 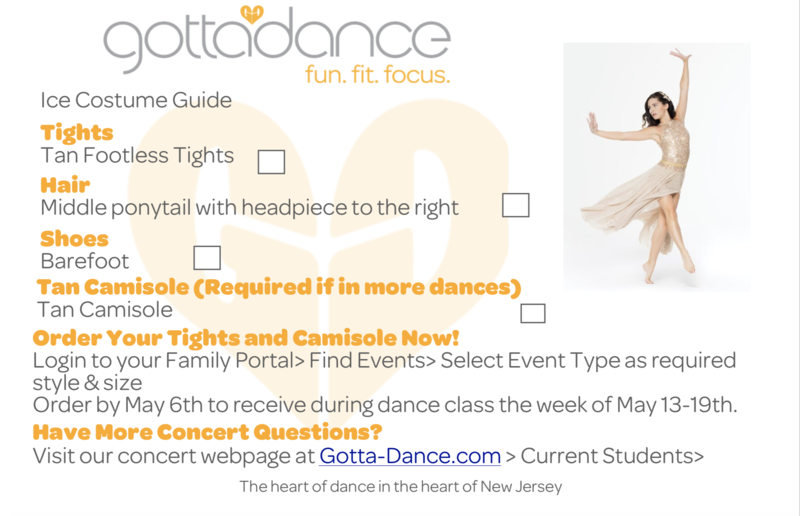 View your dancer’s guide by clicking on their class schedule on our Schedules page. 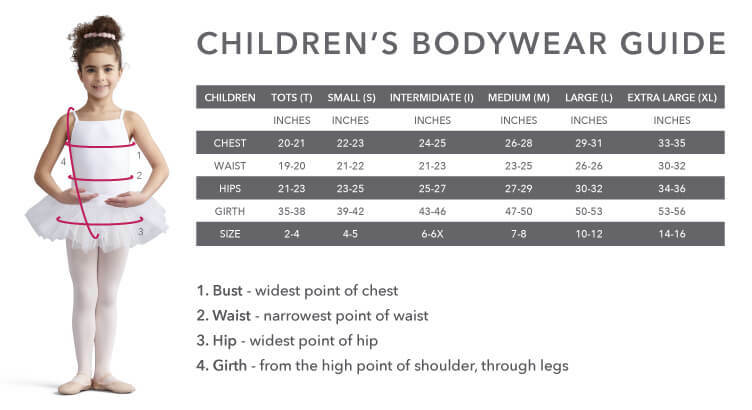 We measure dancers in October and sizes are based on individual dancer’s measurements with room for growth figured in. 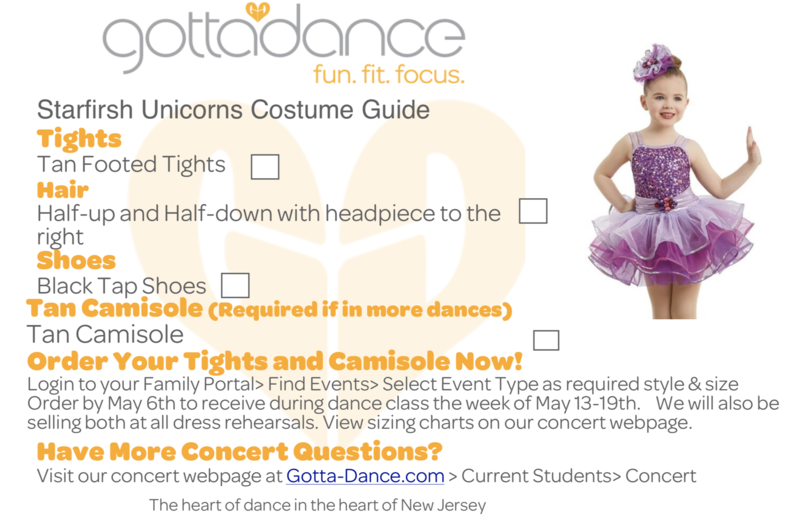 Costumes are standard sizes and not custom-made to your dancer’s measurements. 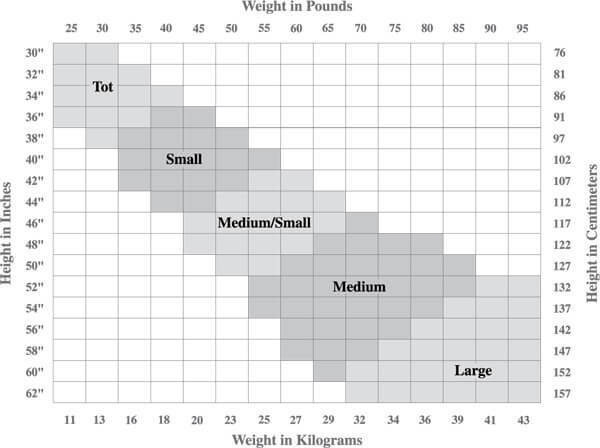 Some dancers may find them big in the waist or a little long in the body. 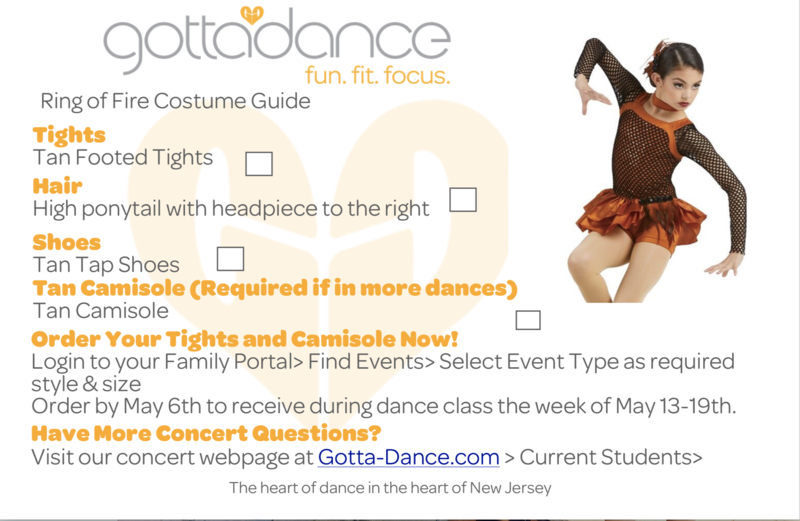 You are free to alter your costume if you would like a custom fit. 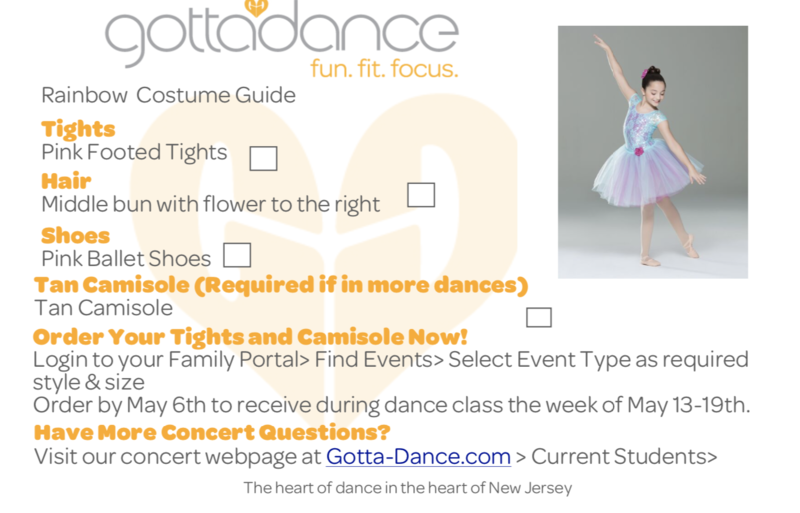 Costume pants can usually be cut to your dancer’s height rather than hemmed. Backstage Group Moms are greatly appreciated and essential to our performances. 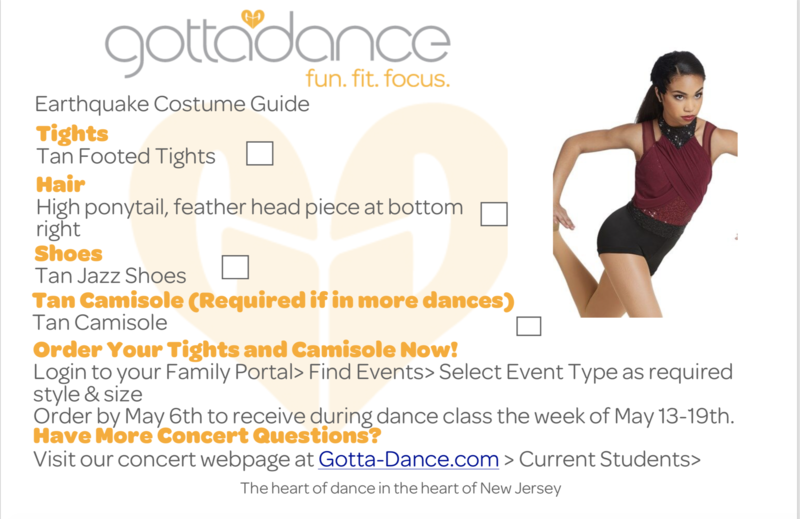 Every year a creative backstage experience is set up for dancers that adds both structure and fun to their concert experience. Group moms do not need a ticket for the show, as they will be working back stage overseeing the dancers. Healthy snacks including water, fruit and gluten free Popcorners snack are offered to all dancers backstage. 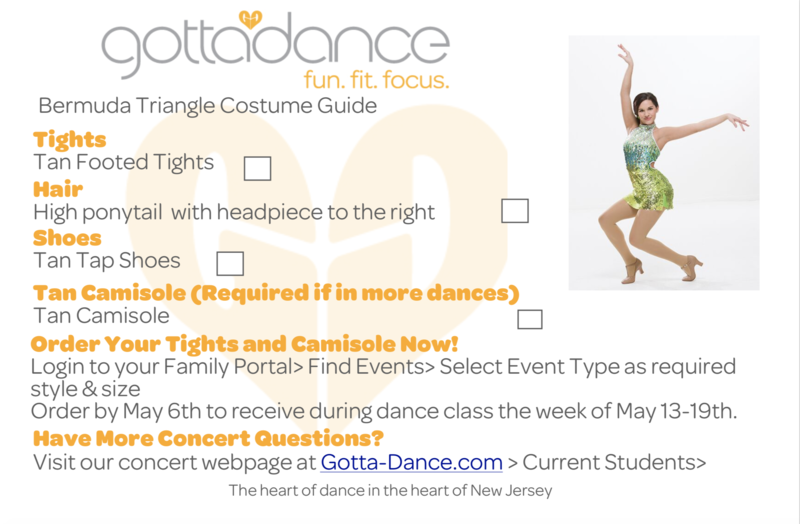 On the day of the concert, please arrive 1 hour and ten minutes early to help assist dancers. 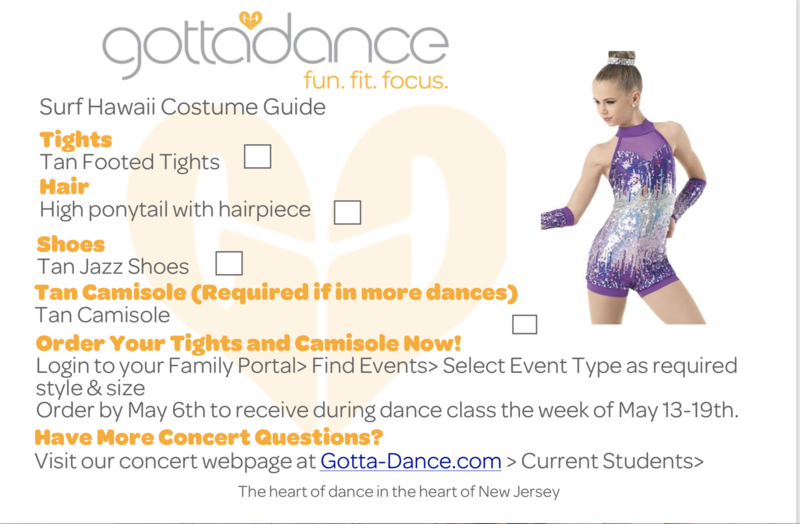 Group Moms will be given a single sheet of paper that includes a timetable of events backstage, the name of your backstage Gotta Dance liaison, any costume changes in your class and the line up order of your dancers. View Group Mom’s Guide. 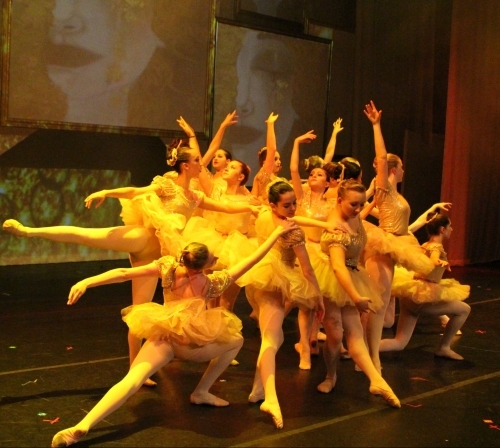 Please drop off your dancer one hour before the start of the show at the Welpe Theater. The door is marked “Dancer’s Entrance”. 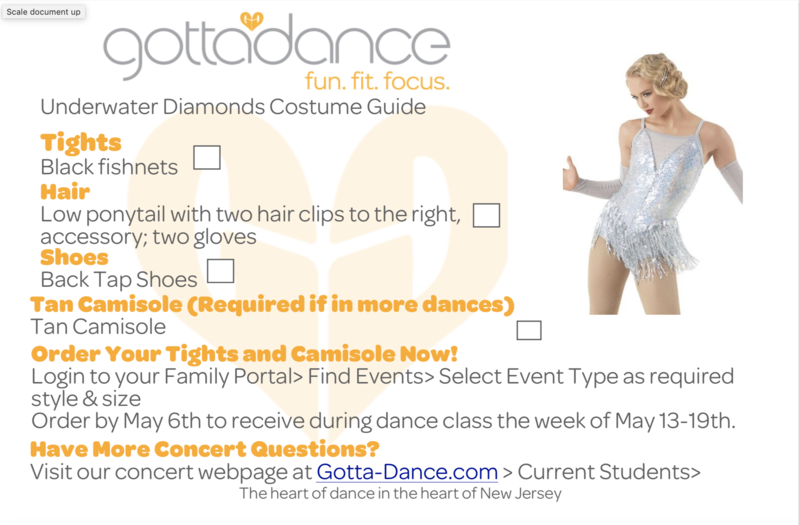 Upon arrival, dancers will be asked if they are receiving any awards, performing in Dad’s Dance and/or if they have any costume changes. 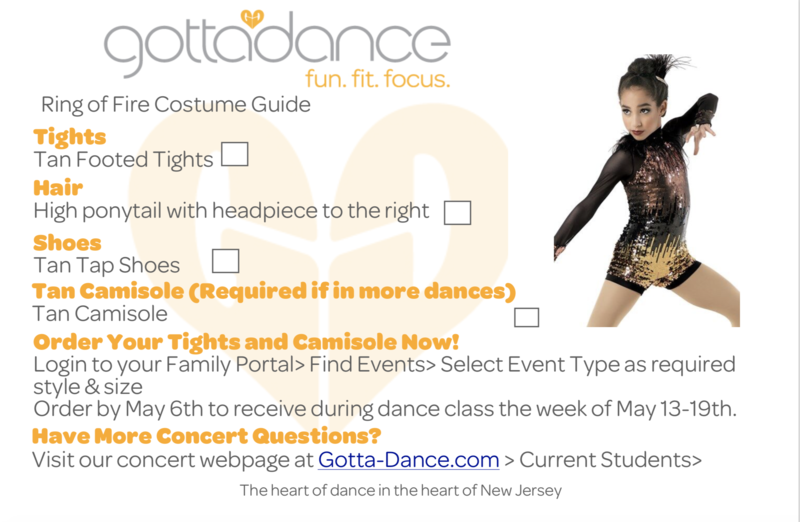 If your dancer has a costume changes, our Gotta Dance backstage staff will explain the procedure and support all dancers with costume changes and hair. 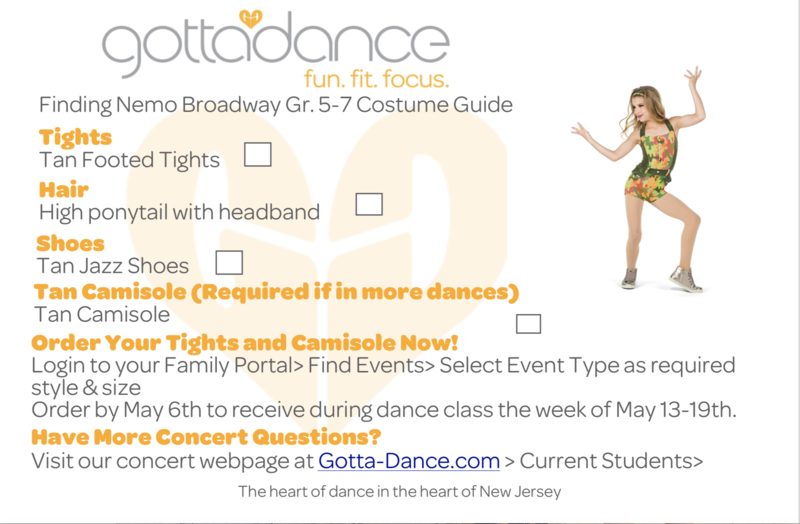 Gotta Dance Educators and backstage staff will be present to take attendance and answer any questions. Did you know that Ushers don’t need a ticket to the Concert? 10 ushers are required for each concert to work before the show and about 20 minutes into the show seating latecomers. After that, ushers are welcome to sit or stand in the back and watch the show. Wear white shirts and black pants. Meet in the coat room when you arrive. This coat room is on the main level in theater lobby near the men’s restroom (to the right). 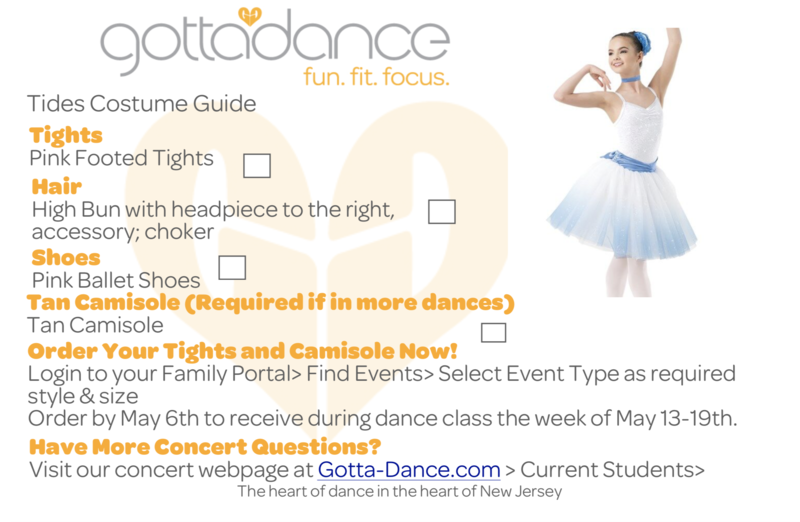 Yearly Achievement Trophies are awarded to students who have attended Gotta Dance for 3, 5, 8, 10, 12 or 15 years. 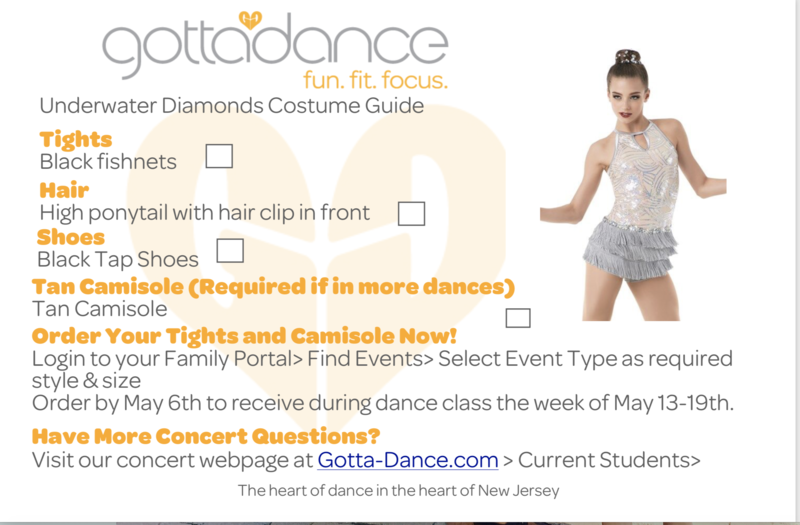 Please register for your dancer’s trophy in advance. 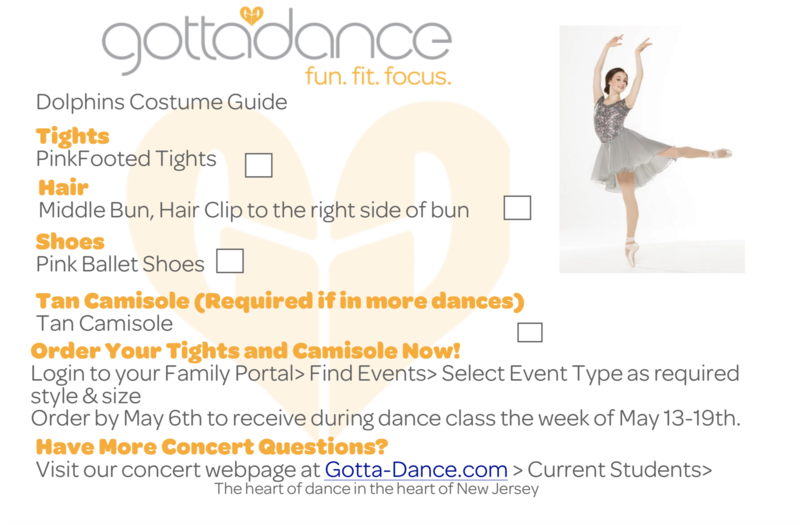 When receiving an award, dancers can decide which concert they would like to receive it in. They even have the option to walk across the stage and receive it in all of their concerts if they would like. 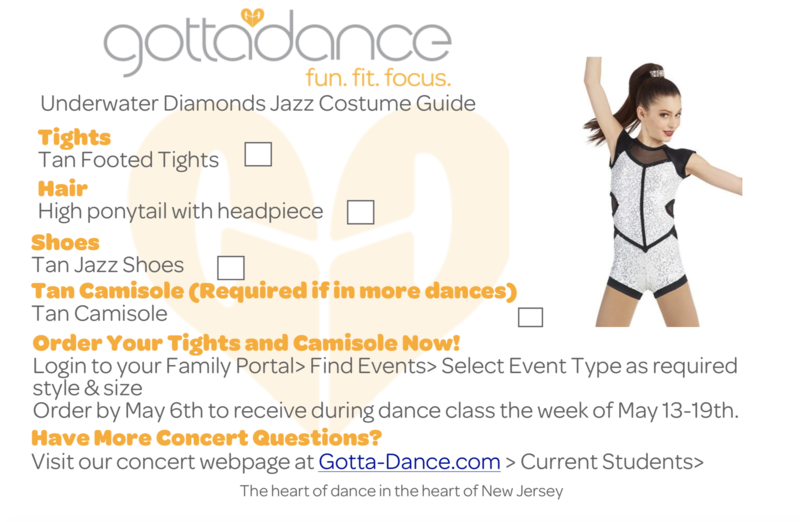 Before each concert, dancers visit the Check In Table to let our Gotta Dance Team know if they will be receiving an award during our Pre-Show. The award they receive in their first concert, is their award to keep and bring home. 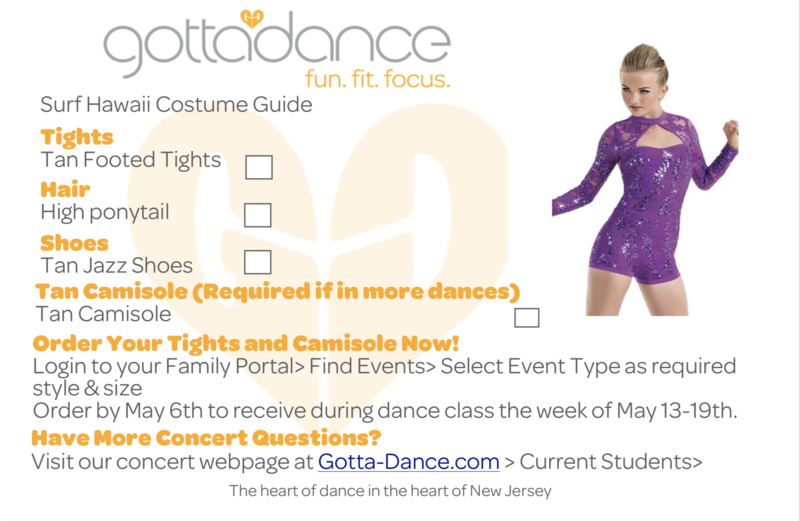 If a dancer would like to receive their award again in the next concert they are performing in, they will once again let our Gotta Dance Team know at the Check In Table when they arrive. However, they will borrow an award from us for this concert. This borrowed award can then be returned to their Dance Educator or another Gotta Dance Team member when they return to the backstage area. 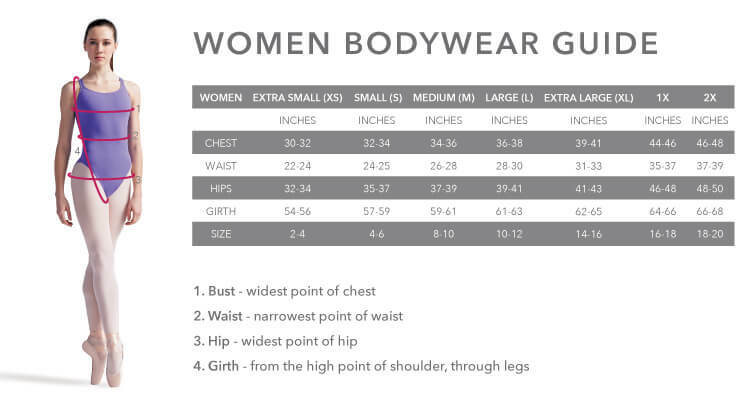 Tights and Camisoles- Purchase now! 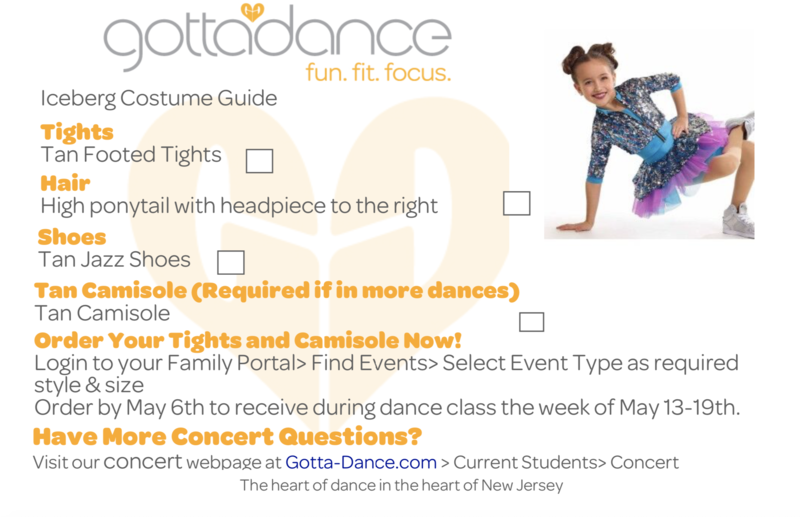 Tights and Camisoles are available to purchase through your family portal. 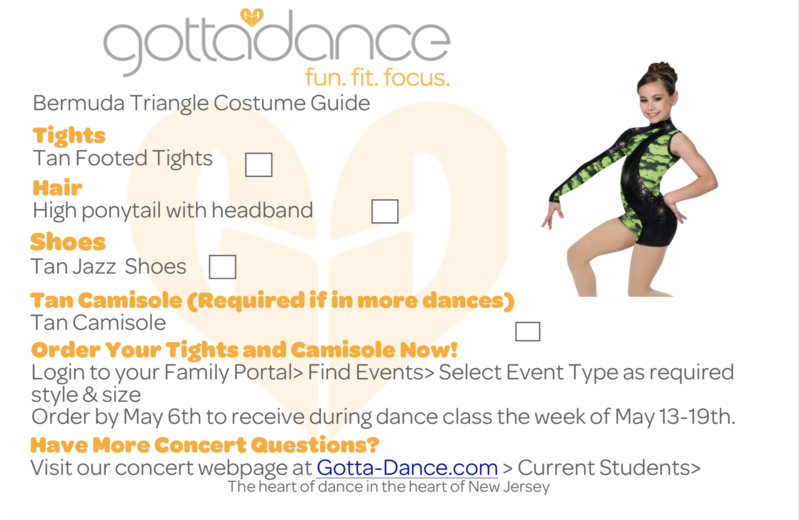 Tights and Camisoles will also be available to purchase during all dress rehearsals at the Raritan Valley Community College. 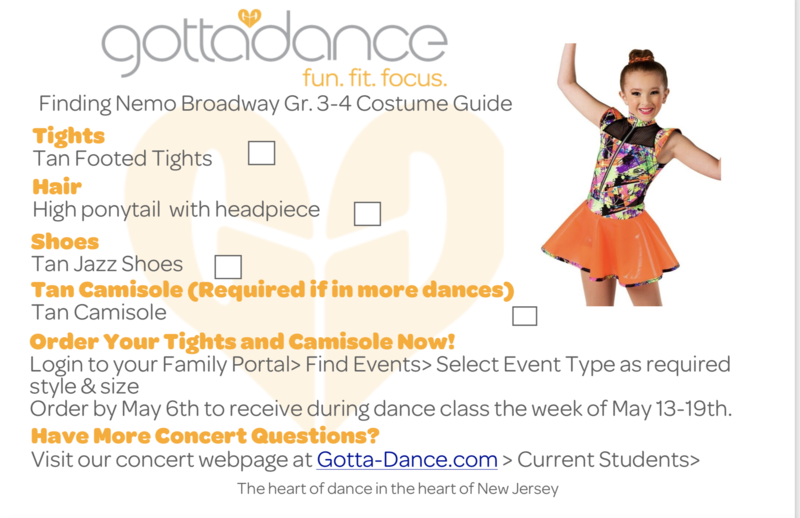 Only cash or personal checks please for purchases during dress rehearsals! 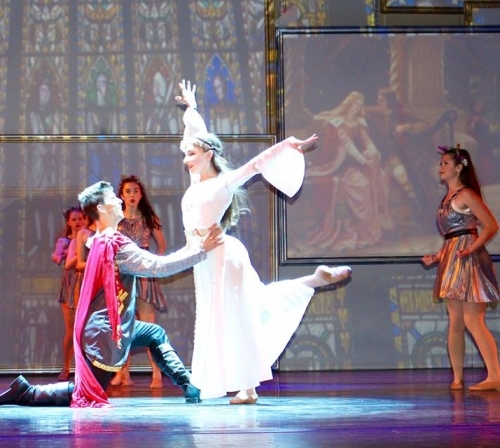 Dancers wear makeup during their performance so that the audience can see the performers better. We have recommended some make-up brands. 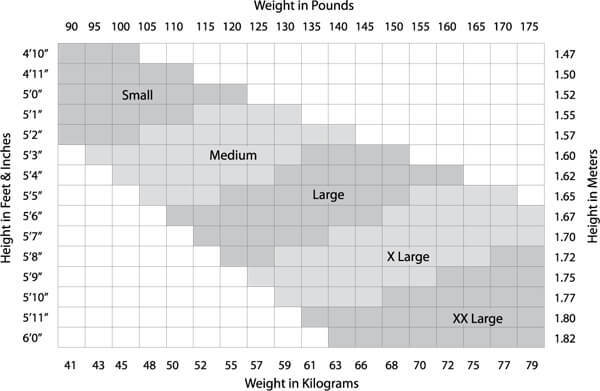 However, it is not necessary to purchase additional makeup if you have something comparable at home. It is completely optional and not mandatory to wear makeup during your dancer’s concert, especially if your dancer is allergic to makeup and/or the brands listed. Apply eyeshadow to the entire eye, then apply brown eyeshadow to the crease of the lid. Make sure to BLEND well! Apply eyeliner to top and bottom of eyes. Apply a light layer of mascara to both your lashes. Apply blush to the apple of the cheek in a circular motion. Line the lips with the liner. Then apply the lipstick, blot and add another coat of lipstick. Every year, our dancing dads await their time to shine in our Dad’s Dance that performs in our June concerts. 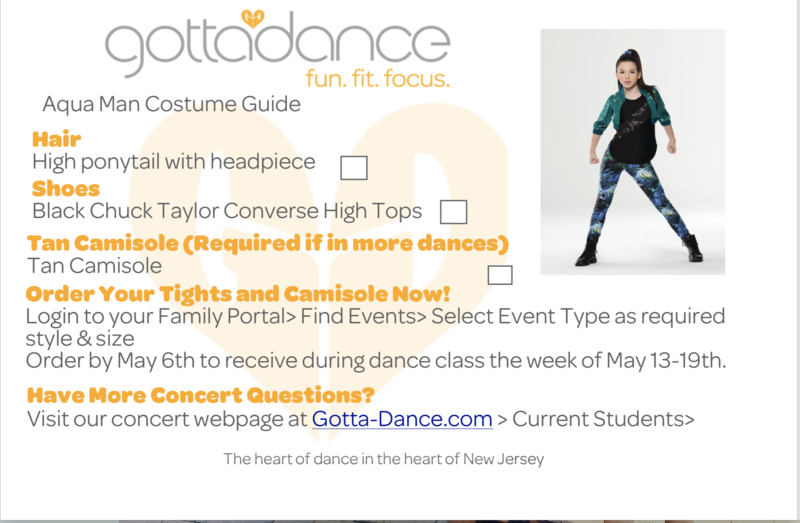 Dancing Dads are director by Gotta Dance’s Miss Linda! We are looking forward to another exciting and fun-filled season! The discovery channel gives it its own week!!!! This year we are going to be……………SHARKS!!!!!! 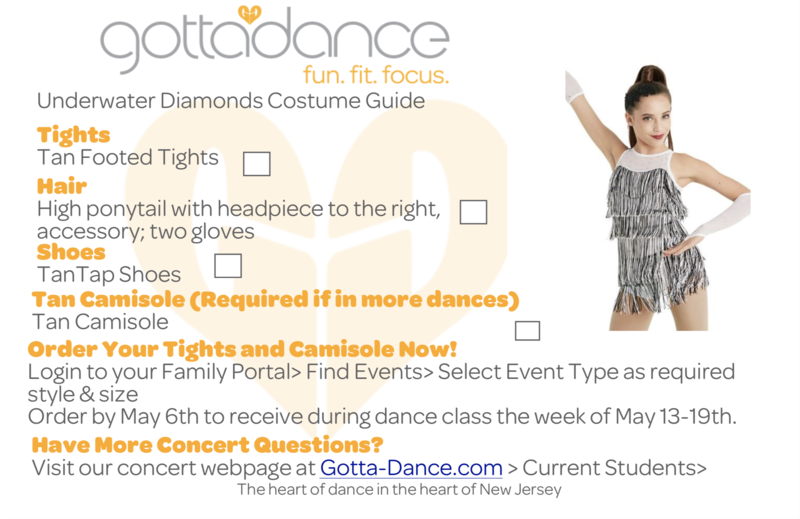 **Dads may attend any or all rehearsals/concerts that fit their schedules. 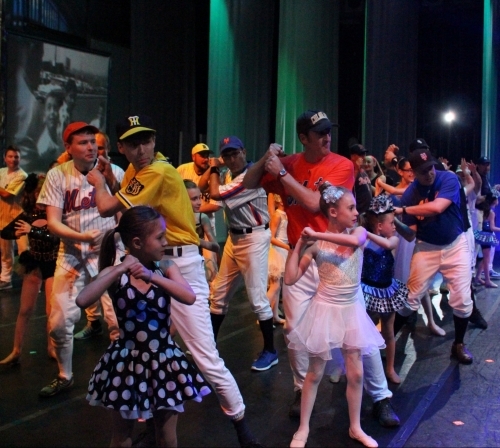 Gotta Dance daughters and sons are invited to the May 17th rehearsal to learn the Dad’s Dance Finale! There is no fee to participate. 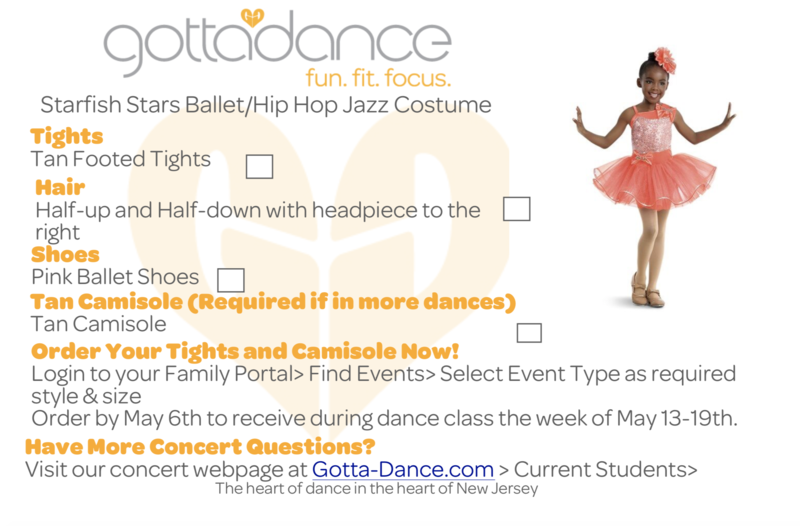 Place your dancer’s name in the registration section, but confirm that you are listed as a contact in your portal. Reflections Studio will be present at all dress rehearsals to take class photos onstage as well as individual photographs in the lobby area. You can come at any time during rehearsal day to be photographed in the lobby, but it’s best to come after your dancer has already rehearsed on stage. To preorder photographs, go to reflectionspreorder.com and choose “Gotta Dance Preorders.” All preorders will be submitted online this year. When you Pre-Order photos you will save $12.00 on individual portraits and $5.00 off group purchases!